the orbit (bony socket surrounding the eye). Ophthalmic plastic surgeons are board-certified ophthalmologists who have completed several years of additional, highly specialized training in plastic surgery. Dr. Michelle White’s attention to detail and her “small town” approach to patient care sets Elite OculoPlastic Surgery apart from other OculoPlastic practices. From your initial consultation, through surgery and post-operative care, you will receive personal attention from Dr. White and every person on our staff. We will provide you with the knowledge and expertise that you deserve. Our goal is to make sure that you understand all of your options and everything our practice has to offer – from Botox to orbital reconstruction. 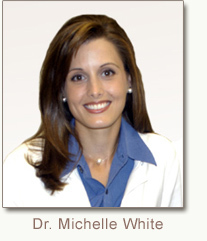 Dr. Michelle White earned her medical degree from The University of Texas Medical School at Houston. She then began her postdoctoral training at the Medical University of South Carolina with an internship in general surgery. Dr. White then pursued her residency in ophthalmology at the Medical University of South Carolina, Storm Eye Institute, Charleston, SC. Most recently she completed a two-year OculoPlastic and Reconstructive Surgery Fellowship Program. Learn more about Dr. White.